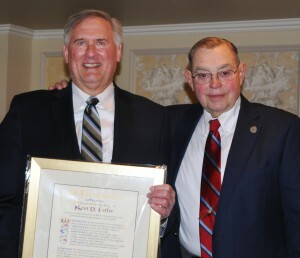 At its 20th Anniversary Celebration on Sunday, March 24, 2013 Pilgrim Church’s Founding Minister, The Reverend Kent Estler, (on the left) was honored with a beautiful hand lettered scroll. The scroll thanked Kent for his dedicated service to the church, its ministers and members over the past 20 years. Our Minister Emeritus, The Reverend Dr. Ken Wildrick presented the scroll to Kent. A well deserved honor from the Lawrence family of Short Hills.